Rather than heading down simply to play his slot at the event, the veteran star said he was aiming to hang out and have a "good time". In an interview with Q magazine about the forthcoming appearance, he said: "I've got nothing else to do on Glasto weekend, and I want to spend some time with my family and have a good time as well." He said that his daughter Jade and Elizabeth "will bring these yurts" to the festival next month. Sir Mick, 69, went on: "I don't need them to show me the cool places to go. I'm sure I can find some places of my own that are much cooler." And asked whether he expected to be hassled, he said: "Depends where I go. I think everyone will be pretty laid back." The frontman said he was no stranger to camping and had been with his own children despite earning millions - although the weather was a little less unpredictable than the UK. He said he had been "on the beach with my kids in the Caribbean, but it's just the same as Brighton - there's just less chance of bad weather". 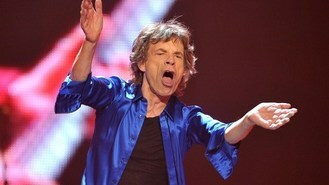 Sir Mick told the magazine, due out later this month: "We went camping all the time when I was a kid. Camping in France was our family holiday. "And we brought baked beans with us, as we didn't trust that fancy foreign food. We were so totally English."